Did you know that we now offer 12 different flavors of Cedar Crest ice cream?? Last October we decided that Thiensville needed an ice cream parlor that was open year round. 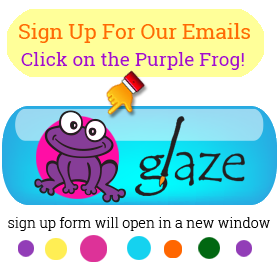 It seemed like a logical fit for glaze as we already had the Purple Frog space- this is the room in the front of the building we often used for our Wine & Dezign classes and adult parties. Because this room wasn’t always in use, we figured transforming it into a colorful ice cream parlor would open the doors to more traffic. 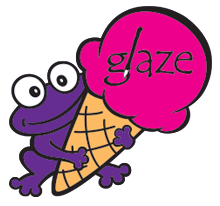 In June of 2016, we re-opened The Purple Frog and introduced ice cream to the Village. We can still hold classes in the space, and we simply moved our adult parties up to the second floor of the studio. Next week I will fill you in on all the different flavors and why we have discovered it’s so much fun to change them up! !